Media captionHauteville House in Guernsey reopens to the public after 18 months of renovation work. 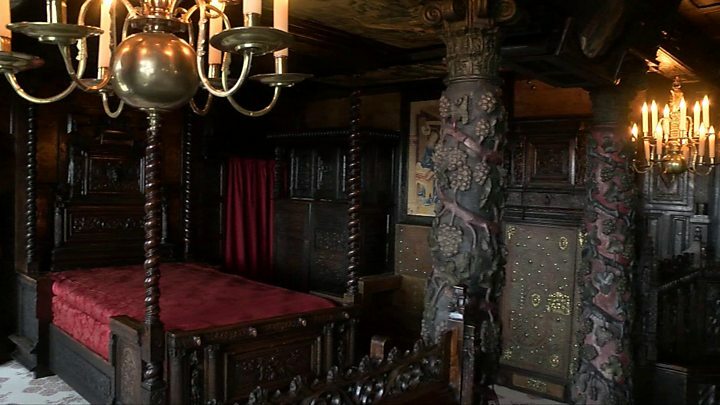 The former Guernsey home of French author Victor Hugo has reopened to the public after extensive restoration. Hugo lived at Hauteville House in St Peter Port between 1856 and 1870, and wrote some of his most celebrated works, including Les Miserables, there. The renovation has recreated the home's original intricate decor, which was designed by the writer himself. The 18-month project came after a billionaire art collector donated £2.6m to save the home. Hugo moved to the Channel Islands in 1855 after being exiled from France for opposing Napoleon III. Hauteville House was the author's home for 14 years, and Guernsey was the inspiration for many of his novels, including Toilers of the Sea. The property was donated to the City of Paris in 1927 and is now a museum dedicated to the author, attracting 20,000 visitors a year. Wrote the celebrated works Les Miserables, Toilers of the Sea, The Man Who Laughs, The Legend of the Ages, Ninety-Three at Hauteville House in St Peter Port. Hauteville House's intricate interior had fallen into disrepair, while the property's fragile structure had been damaged by the effects of the weather. Restoration work included a complete renovation of the two-storey conservatory and glazed writing room, know as "The Look-out", both of which were designed by Hugo. The interiors, including tapestries, wood panelling and decoration made from felt and ceramic, were also restored based on original documentation and period photographs. Commenting on the renovation work, the writer's great-great-grandson, Jean Baptiste Hugo, said: "As a Hugo this is so precious. For us, it's the family seat, really. "Compared to Paris, where it wasn't his house - it was a flat he rented - here is really the house he created himself."